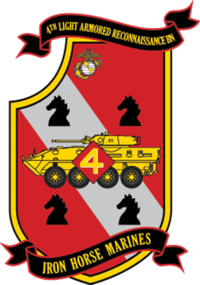 4th Light Armored Reconnaissance Battalion (4th LAR) is a mechanized infantry battalion of the United States Marine Corps reserve. Their primary weapon system is the LAV-25 and they are part of the 4th Marine Division and Marine Forces Reserve. The unit headquarters is at Camp Pendleton, California but other units in the battalion are located throughout the United States. The LAR battalion performs combined arms reconnaissance and security missions in support of the Ground Combat Element (GCE) of a Marine Air-Ground Task Force (MAGTF). Its mission is to conduct reconnaissance, security and economy of force operations, and, within its capabilities, limited offensive or defensive operations that exploit the unit’s mobility and firepower. The LAR battalion may function as an independent maneuver element or as an element of a larger unit such as a regimental combat team, or its subordinate companies may support other tactical units in the GCE. An LAV platoon consists of 4 vehicles usually divided into Alpha section and Bravo section. The platoon commander will control one section and also be the vehicle commander (VC) of one of the LAV'S and the platoon sergeant will control the other section as well as be VC as well. A crew consists of a driver, usually the least senior (0313, the MOS designation for LAV Crewman), a VC and the gunner. The gunner operates the main gun, the M242 Bushmaster chaingun. The VC makes target acquisition changes and helps the gunner make adjustments. The remaining crew consists of Scouts (0311). The LAV can hold as many as six scouts, but in most cases there are only three to four in the back. There is also one corpsman per platoon. 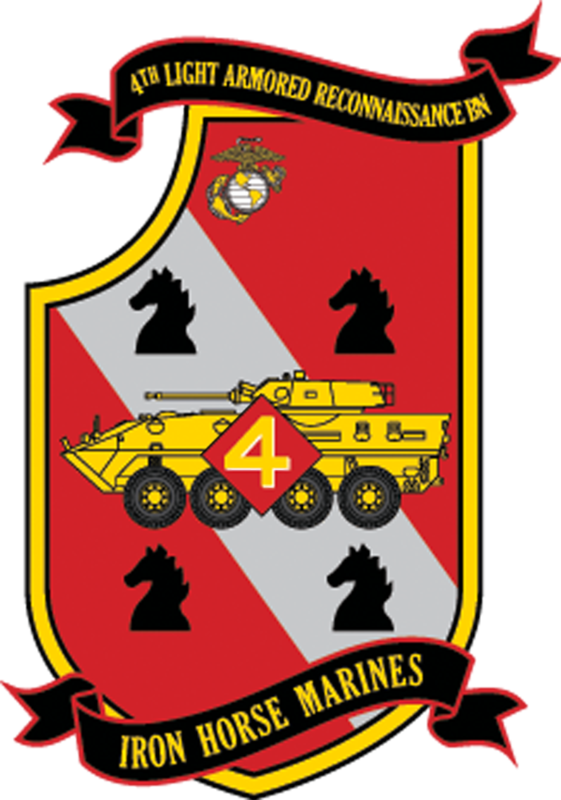 The 4th Light Armored Vehicle Battalion was activated on September 23, 1987. From December 26, 1990 to April 24, 1991 deployed to the Kingdom of Saudi Arabia as part of Operation Desert Shield and Operation Desert Storm. The Battalion's assets were spread out over hundreds of miles of desert terrain and were utilized by the Marine Command to constantly probe the boundaries of Iraqi controlled areas. The Battalion executed Reconnaissance and Counter Reconnaissance Operations, emergency extraction of friendly forces, breaching of berms and minefields along the Iraqi and Kuwait border and prisoner capture and control. On October 1, 1996 the battalion was re-designated as the 4th Light Armored Reconnaissance Battalion. A corpsman with Delta Co., 4th Light Armored Reconnaissance Battalion, delivers medical supplies to be issued to more than 200 Iraqis during a cooperative medical engagement in Akashat. From February 24, 2003 to October 1, 2003, 4th LAR deployed to Iraq in support of Operation Iraqi Freedom (OIF). Alpha and Bravo companies were mobilized in early February 2003 and deployed with 1st and 3rd LAR Battalions respectively, participating in the 2003 invasion of Iraq. The remainder of the battalion was activated in early March 2003 and quickly deployed to Iraq. In April 2003, Delta Company 1st Platoon and H&S Company Black Sheep Platoon, 2nd Section was attached to 2nd Battalion 8th Marines as part of Task Force Rebel. Task Force Rebel was tasked with patrolling and securing the city of Al Kut in the Wasit province. In May 2003 the battalion was reconstituted as a whole and conducted surveillance and reconnaissance operations along the Iraq/Iran Border. On June 2, 2003 the battalion moved to the 1st Marine Division HQ, located in Al Hilla to act as the Division quick reaction force. Bravo Company was based in Ad Diwaniyah, and generally conducted missions separately from the rest of the battalion. On June 13, 2003 Task Force Scorpion was activated and moved to the Northern Babil province with orders to secure Army convoy routes in and out of Forward Operating Base Dogwood. The core of Task Force Scorpion was initially formed around 4th Light Armored Reconnaissance Battalion, consisting initially of H&S and Alpha Companies, 4th LAR; Co C, 1st Battalion 4th Marines, Co I (Rein), 3rd Battalion, 7th Marines, Co E, 2nd Battalion, 5th Marines, two platoons from Force Reconnaissance; an Explosive Ordnance Disposal (EOD) detachment; and elements of Radio Battalion. The Task Force was later reinforced with Delta Company and two other active duty infantry companies from 1st Battalion 7th Marines. Task Force Scorpion's offensive posture and heavy patrolling effectively reduced the number of attacks on American soldiers in the area. The battalion conducted numerous raids and was eventually awarded the Presidential Unit Citation for its work as part of I Marine Expeditionary Force. Since OIF I, Marines from the battalion have continued to support on-going combat and security operations associated with the Global War on Terror. Several Marines returned to Iraq with the 1st Marine Division, serving as members of the Division Commander's Personal Security Detachment and as military advisers to Iraqi infantry units. In 2006, members of Co A and H&S Company were mobilized and formed the 4th Provisional Security Company and deployed to the Horn of Africa. Also Co B was mobilized and returned to Iraq on October 11, 2006 to serve Dam Security Unit-3 conducting riverine reconnaissance, support, and security operations from Al-Qa'im to Fallujah. They returned to the United States on April 1, 2007  In June 2007, Marines of Company C were mobilized and attached to 1st Battalion 10th Marines as part of Task Force Military Police. Stationed in Fallujah, they conducted police and security operations, including convoy security and detainee movements, throughout the Anbar Province and returned home in April 2008. In December 2007, Marines of Company D were mobilized and attached to 2nd Light Armored Reconnaissance Battalion out of Camp Lejeune for their deployment in support of OIF. They operated with 2nd LAR along the Syrian border and covered an area as large as South Carolina. The Marines of Delta Company were operating out of a train station in the town of Akashat, north of Camp Korean Village. They returned to the United States in October 2008, and were replaced by Fox Company and Marines from 2/25. Fox Company 4th LAR remained at Akashat until October 2008 before moving north to Al Ambar Provence. South of Sinjar Mountains and as far west as Syria. Fox Company Marines attached to 1st LAR returned to Al Asad in March 2009 after setting an OIF record of a confirmed 94 days spent in field with logistic support. Fox Company Marines returned home April 20, 2009 to Eastover, S.C. This record was later broken and nearly doubled by Company E from Syracuse, NY during their 2009 deployment along the Syrian border, north of the Sinjar mountains. It remains the longest continuous period spent on non-stop operations during the Iraq war. In September 2009, the unit mobilized for deployment in Afghanistan. H&S, Alpha, Bravo, Charlie, and a handful of Marines from Delta and Fox were activated, and trained for a six-month deployment schedule of November 2009 to May 2010. They returned home on May 30, 2010. ↑ "Employment of the Light Armored Reconnaissance Battalion". MCWP 3–14. Headquarters Marine Corps. 17 September 2009. ↑ Wyer, Sgt Colin. "Ground Forces Commander Tells Troops 'You Cannot Fail'". www.defendamerica.mil. http://www.defendamerica.mil/articles/aug2003/a080703e.html. Retrieved 2007-04-02. ↑ "Raid in Iraq's 'Indian Country'". United Press International. http://www.upi.com/archive/view.php?archive=1&StoryID=20030804-022042-6813r. Retrieved 2007-04-02. ↑ "Marines return to U.S.". The Frderick New-Post Online. http://www.fredericknewspost.com/sections/archives/display_detail.htm?StoryID=66787. Retrieved 2007-04-02.